Stockpiling...I guess it kind of runs in the family...remember the toilet paper in the bookcase? A little organizational skill and a second refrigerator go a long way toward keeping up with the every day supply and demand. Here's part of my stash. Last Friday Cardiogirl shared her intense feeling of gloaming (think gloom) over possibly running out of some of their morning staples. Imagine her relief at finding her backups. I know the panic of running out of something you depend on every day! 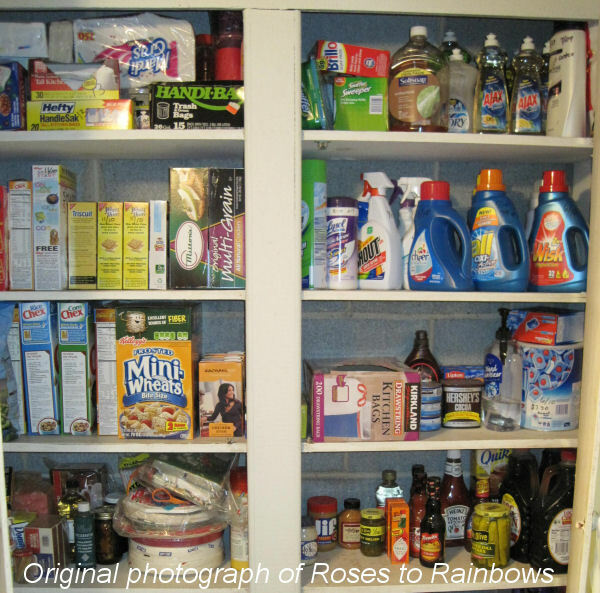 That is why I have my stash of everything from food items, to paper goods and laundry supplies. Having a stash doesn't have to break the budget either. I shop at both Costco and grocery store sales, and I use coupons at both. Good money-saving strategies add even more value to your stockpile. So, do you stockpile, and if so, what's in your stash? Restaurants.com has a new promotion going on now through June 24. All gift certificates are 80% off. Just use the promo code SUMMER when you check out, and your discount will be applied. You can get $25 gift certificates for just $2. What a great way to eat out and save! EXTENDED THROUGH JUNE 30. Restaurants.com 80% off Promotion - 3 Days Only! Restaurants.com has a new promotion going on now through June 10. All gift certificates are 80% off. Just use the promo code SAVE when you check out, and your discount will be applied. You can get $25 gift certificates for just $2. What a great way to eat out and save! Restaurants.com has a new promotion going on now through May 31. All gift certificates are 80% off. Just use the promo code FLAG when you check out, and your discount will be applied. You can get $25 gift certificates for just $2. Restaurants.com has a new promotion going on now through May 13. All gift certificates are 80% off. Just use the promo code ENJOY when you check out, and your discount will be applied. You can get $25 gift certificates for just $2. We've talked a lot about how to get the most out of your coupons at the grocery stores, drug stores, Walmart and Target. Perhaps you've been wondering where else you can use your coupons. There are some "discount" stores such as Family Dollar and Dollar General that will accept them, and others like Big Lots and Dollar Tree that will not. No overage given when coupon is greater than item purchased. You may stack manufacturers coupons with store coupons. No free item coupons unless purchase required (BOGOF). Dollar Tree does not accept any manufacturers coupons. Big Lots does not accept any manufacturers coupons. They only accept the Big Lots printable coupons available to Buzz club members. Note: Dollar Tree (all items $1.00), Dollar General and Family Dollar are different stores. Dollar General and Family Dollar are NOT "dollar stores", and prices vary. As always, please review the coupon policy for each store, and use coupons accordingly. Restaurants.com 80% Off Promotion - limited time! Restaurants.com has a new promotion going on now through April 26. All gift certificates are 80% off. Just use the promo code MEAL when you check out, and your discount will be applied. You can get $25 gift certificates for just $2. What a great way to eat out and save! Offer Extended Until April 30. The economy may be improving, but for those new parents and parents to be, there are new expenses on the horizon, and it is a broad horizon spanning 18 years or more. This requires commitment and sacrifice, but it shouldn't land you in the poor house, at least not in the first few years of life...as scenes of Harvard flash before your eyes. But first things first, you need to prepare for your upcoming bundle of joy. You need clothes by the bundles, diapers, food, baby toiletries, and maybe formula and bottles. You may wonder what I'm doing writing a post about baby stuff when all my children have four legs and fur. Well, the answer is simple. I want to help people save money, and steer them in the direction of value and information. There are a number of websites out there devoted to coupon savings, where to get the deals on diapers and how to work the system to even get free stuff. I have sorted through and pulled out what I think are some good ones. Some are simply money savers, some have reviews and others will relate their experiences so you'll know you're not alone in baby-land. Let's start with money saving. After all that's probably at the top of everyone's list. This first group isn't baby-specific, but they provide sale information and coupon match-ups for food, household goods, personal care and baby items. This site has a myriad of different savings from Target and Wal-Mart to the 3 major drugstores, Walgreen's, CVS and Rite Aid. She has even included store guides so you'll learn how to take full advantage of the savings available. Yes, there are things to learn about drugstore shopping, and all three stores are different. She also offers lot of on-line deals like books and toys from Amazon. This one covers local grocery stores such as Harris Teeter and Food Lion plus other regional stores with coupon match-ups. It also covers the same 3 drugstores, offering another take on the same sales. Sometimes grocery stores such as Food Lion, have printable coupons on-line. In addition to food and household items, there are usually several sets of baby care coupons. This provides information on cost-conscious decorating, baby product reviews, coupons and sales and diapers and other products. There is a product review on diapers, and what other mom's have to say about the different brands and styles, including generics/store brands. A wealth of baby information, health and support, links to blogs, questions and answers and more. This may not suit all new parents, but I suggest checking out thrift stores, and consignment shops. Every parent wants their babies dressed in adorable little outfits, and they should be. However, they grow out of everything so quickly, especially in the first year, that it can be very costly to keep up with their ever-changing dimensions. While you can't cover all your baby's wardrobe needs at these places, you can find new, or nearly new items, even brand names, for a fraction of mall and specialty shop prices to help offset the other costs. Network with friends and family who already have children. Baby clothes will be outgrown before being worn out so see if someone has clothes to loan or give away. The same goes for items like strollers, car seats, high chairs and cribs. There is much repetition among the coupon sites. Many cover the same stores and have the same coupons. You just need to find the ones that best> meet your needs. As always, pay attention to your coupons for restrictions such as size, item count, etc., and use coupons appropriately. Restaurants.com has a new promotion going on now through April 6. All gift certificates are 80% off. Just use the promo code CHOW when you check out, and your discount will be applied. You can get $25 gift certificates for just $2. Restaurants.com has a new promotion going on now through March 31. All gift certificates are 80% off. Just use the promo code COOK when you check out, and your discount will be applied. You can get $25 gift certificates for just $2. Restaurants.com has a new promotion going on now through March 16. All gift certificates are 80% off. Just use the promo code BITE when you check out, and your discount will be applied. You can get $25 gift certificates for just $2. What a deal! I have used these several times now, and they're a great way to save! Change back from your dime! Think I'm kidding? What, you ask, can you get for under 10 cents? Well, I was in CVS picking up a prescription for my hubby, and I had these Extra Bucks that were going to expire soon. Now I wasn't about to let that happen. No siree, that's money! So I started looking around the store for something I wanted, needed, someone else needed, but I came up empty, not even a Valentine card. I was about to walk out when I decided to hit the food aisle. No, I don't usually buy food at a drug store, but sometimes you get lucky. Now, I had $3 in Extra Bucks and the DAK canned hams just happened to be on sale for, you guessed it, $3. That's not the brand I normally buy, so I was going to pass. I walked a bit further up the aisle and spotted small boxes of Wheat Thins for $1 each (marked down from $1.99). It just so happened that I had a coupon for $2 off any 2 boxes of Nabisco snack crackers (no size or variety restrictions). I couldn't pass that up - 2 free boxes of crackers. Thinking just how great a deal it would be to get the ham with my Extra Bucks and free crackers, I went back for the ham. After the EBs and coupon, my subtotal was $0.00, and I paid only tax. And that, folks, is how I got change back from my dime. I mean it didn't seem right to swipe my card for 8 cents. Good things come to those who coupon. Gracie: Do you have a shopping list, Tia Carmen? Tia Carmen: I don't need one Gracie. My shopping list is very simple. Things I have a coupon for and things that are on sale. It's amazing how fast time goes by, and once again Christmas is just around the corner. Yep, just 9 days away. Is your tree sparkling from top to bottom with a zillion lights, and ornaments of silver and gold, red and green, and all the trimmings? Do you have all your shopping done? Presents all around the tree? I finally started wrapping/bagging yesterday. My list is short these days, and on-line shopping makes is so much easier. No driving all over town, waiting in long lines of traffic and longer lines in the stores. Just click here, click there and you're done. Simple. So far, I've had 3 orders from Amazon, one from Penzeys, cashed in green points for a gift card, and ordered ink for my printer to print more money-saving coupons. The more you save, the more you can give. I still have a few gifts to get for the "hard to shop for" folks. My guess is gift cards for them. I know that sounds like a cop-out, but personally I never mind getting gift cards. Being the frugal shopper that I am, I make the most of them. So, my thoughts in a nutshell...Shop on-line, use coupon codes and seek out free shipping deals. When you do have to go to the stores, the same principles apply. Use coupons, especially combined with sales to get the best deals.